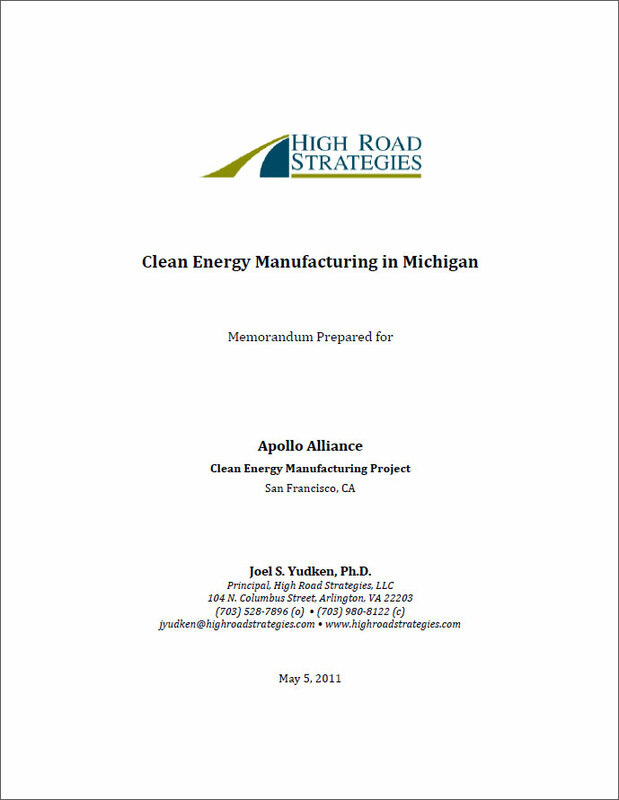 In March 2011, the Apollo Alliance, now merged into the BlueGreen Alliance (BGA/Apollo), commissioned High Road Strategies to research and develop policy recommendations for promoting clean energy manufacturing (CEM) in Michigan and California. (BGA contracted with Policy Matters Ohio to conduct a similar policy study focused on Ohio.) High Road Strategies produced several different research and policy documents with the principal goal of at evaluating and recommending federal and state policies that support CEM. It provides a broad overview of U.S. manufacturing policy, which has roots going back to the 1980s, when U.S. manufacturing competitiveness first emerged as a major policy concern. The policy areas examined include federal technology development and innovation, technical assistance for manufacturers for technology modernization, business development and modernization, workforce development, economic development, and trade and export assistance. It reviews major enabling legislation for CEM, such as ARRA and the Energy Policy Act of 2005 (EPACT), which mostly have a broad energy policy focus but include programs that support or enable CEM. Most of the clean energy policies in the American Recovery and Reinvestment Act of 2009 (ARRA) (P.L. 111-5) and other legislative proposals were designed to support the growth of clean energy markets—i.e., for renewable energy sources and energy efficiency. It reviews a wide range of policies and programs specifically targeting CEM, which needs to be understood as a subset and extension of general manufacturing policy. Michigan CEM. High Road Strategies then produced research and policy reports summarizing the trends, status, and policies supporting clean CEM growth in Michigan and in California. 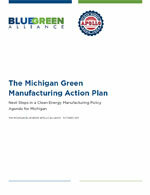 Its first report, Clean Energy Manufacturing in Michigan (May 5, 2011), is an overview of clean energy manufacturing activities and policies in Michigan. Over the past decade, backed by significant state and federal initiatives and resources, Michigan has become one of the premier centers of CEM in the United States. This growth built on the strengths of Michigan’s powerful manufacturing sector (especially its automotive, metal fabrication, and machinery industries) and advanced technology capabilities, a highly skilled, experienced workforce, top-rated academic institutions, and rich natural resource endowments. Michigan especially excels in four major CEM sectors, which are reviewed in the report—advanced energy storage (advanced batteries), wind energy, solar energy, and biofuels. Also reviewed are state and federal policy initiatives (financial resources and tax incentives; technology R&D; renewable portfolio standards; etc.) begun early in the last decade, to encourage and support investments in clean energy generation and manufacturing. The policies of former Governor Jennifer M. Granholm, whose second term ended in January 2011, were especially instrumental. Federal stimulus investments (i.e., via ARRA) helped to amplify and supplement the state efforts begun under Granholm to grow a clean energy sector. Despite the substantial increase in CEM in Michigan over the last decade, stimulated and supported by state and federal policies and programs, the future health of this sector within the state is unclear. The political environment, both at the federal level within Congress and in the new administration and legislature in Michigan, is decidedly not as friendly to clean energy initiatives that will be needed to maintain momentum in building competitive CEM industries in Michigan. Nevertheless, the report contends that Michigan could enjoy large economic gains with significant new investments in clean energy generation and manufacturing. Moreover, proponents tout the potential for helping to revitalize Michigan’s ailing manufacturing industries, especially auto manufacturing, which has direct tie-ins to CEM-based industries such as advanced energy storage and biofuels. The report further calls for policies that support the demand for and use of clean energy resources while also building up the state’s capabilities for making products used to supply clean energy throughout the economy. The danger is that in the coming years, the United States, and major manufacturing states such as Michigan, in particular, will greatly diminish support for clean energy, while Europe countries, China, and Japan continue to rapidly move ahead in these areas, backed by substantial government programs. Michigan GreenMAP. 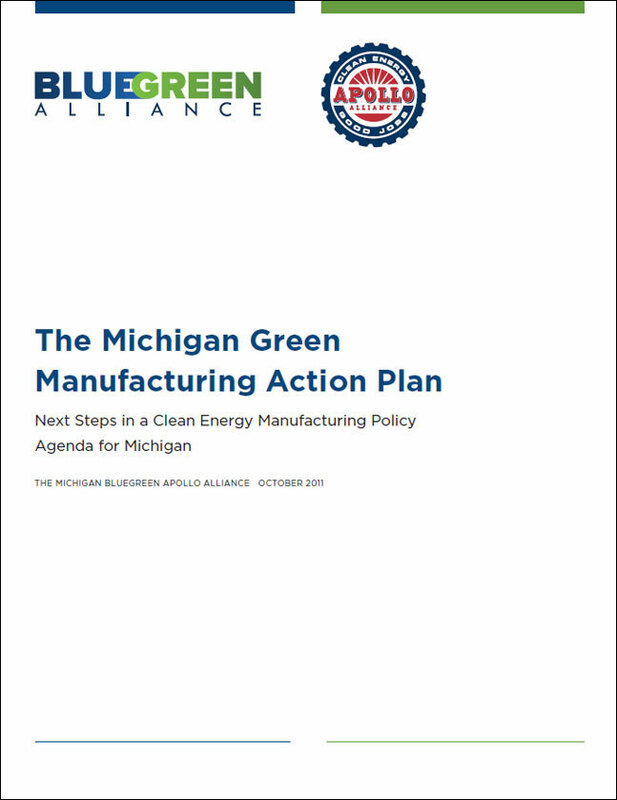 The Michigan CEM report was produced as a background reference for the BGA/Apollo Alliance Michigan Green Manufacturing Action Plan (GreenMAP) project. Michigan staff of BGA/Apollo convened a task force of representatives from the business, investor, labor, policy, and environmental communities, which reviewed and approved a set of CEM policies, in conjunction with BGA/Apollo staff, presented in the report The Michigan Green Manufacturing Action Plan: Next Steps in a Clean Energy Manufacturing Policy, released in October 2011. 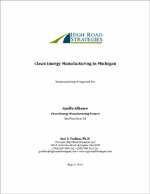 The purpose of the report was to “offer advice on what additional steps Michigan can take to win the competition for clean energy manufacturing jobs.” Research and an initial set of recommendations developed by High Road Strategies provided the intellectual foundation for this work. The primary recommendations include strengthening state policies that create demand for clean energy; increase access to capital for clean energy manufacturers (e.g., loan and financial incentive programs, investing state employee pension funds and university endowments, creation of a Michigan Clean Energy Bank); support for small- and medium-sized clean energy manufacturers; clean energy technology cluster initiatives; workforce training initiatives; and pushing for CEM policy aat the federal and regional levels. For more information click here. California CEM and GreenMAP. 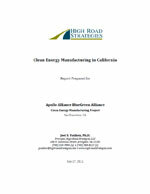 High Road Strategies produced a second research report on CEM activity and policies in California, Clean Energy Manufacturing in California (July 17, 2011). The report reviews the current state of clean energy manufacturing in California, viewing it in the context of its huge manufacturing base—the largest in the nation—and its well-developed clean energy economy value chain. California enjoys a unique place in the nation, if not the world, as a pioneer in the development and adoption of renewable energy technologies. It has a long history going back to at least the 1970s, with both state and federal programs that have directly encouraged and fostered growth in clean energy systems—solar, wind, advanced batteries and biofuels, in particular. This history has made California the premier state in the nation, and a global leader, in clean energy production and manufacturing. For example, California leads in solar power generation and manufacturing, accounting for nearly half of all solar power in the United States, and is one of six states with large-scale concentrating solar power. It also has the largest number of solar business in the nation—it currently is home to about 30 percent of all solar companies and estimated solar jobs in the United States. The report also examines the principal federal and state policies and initiatives that have played—and continue to play—a critical role in spawning, developing, and sustaining the state’s clean energy manufacturing sector. It also touches on the challenges and barriers that need to be addressed to maintain and extend this sector, in the face of the worst economic recession—and highest unemployment—the state has faced in many decades, not to mention its severe budget crisis. 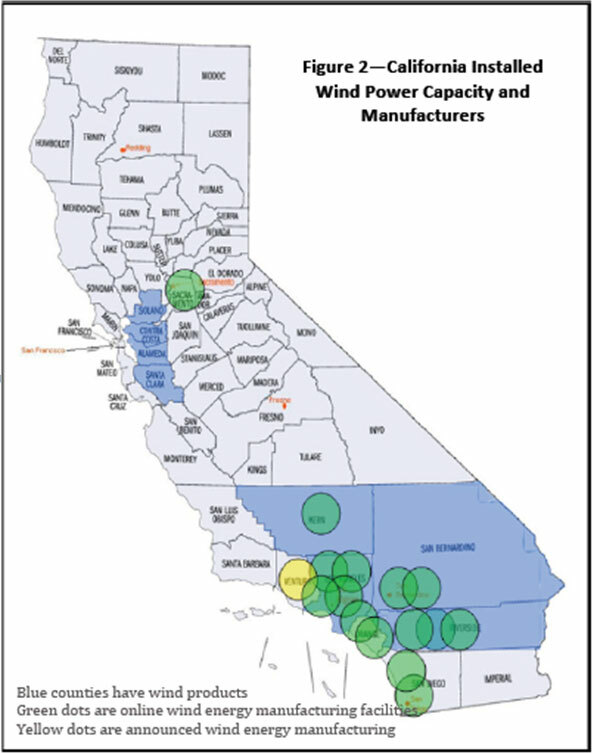 The report shows that along with California’s considerable economic, technological, financial, human and natural resources endowments, Federal and state policies have been critical drivers of the growth of California’s renewable energy capacity. Despite the state’s current economic difficulties, recent studies have shown positive trends and projected growth in California’s green sectors. California has pioneered in enacting and implementing policies that made it an early leader in clean energy production, complemented by federal policies that drove the growth of clean energy at a national level. For example, the introduction of major clean energy policies such as AB 32 and the Renewable Portfolio Standard (RPS), as well as a number of other state and federal programs have spurred growth in California’s clean energy production and manufacturing sector. Over the past few years, the state has instituted several programs to incentivize and assist clean energy manufacturers, with support from former Governor Schwarzenegger and the current Governor Brown, as well as California’s legislature. They include financial incentives and energy–related tax credits specifically targeted to clean energy manufacturing. The state also has supported programs supporting R&D and innovation in clean energy technologies, and workforce development, among others. 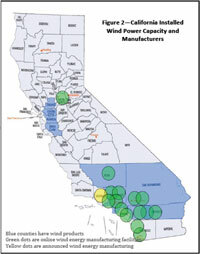 Federal programs since the economic crisis have also encouraged growth in clean energy capacity and manufacturing in California. They have provided either direct support to clean energy projects in the state, or funding distributed through state programs. ARRA funding in particular has been crucial in maintaining and/or bolstering the capabilities of existing state programs, both in California and across the country. In some instances, it spurred new programs to dispense the ARRA funds, that otherwise might not have existed. 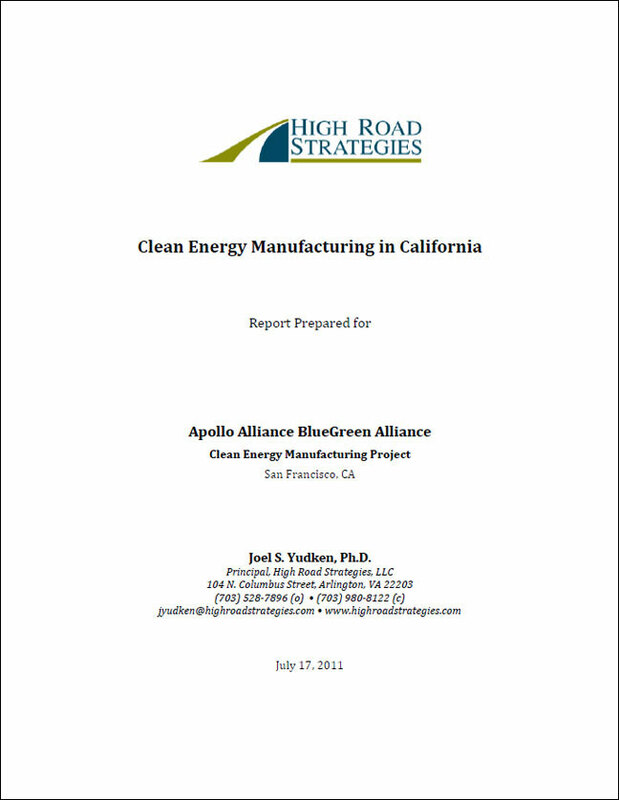 Drawing on this work, High Road Strategies also developed a set of CEM policy recommendations, as it did in Michigan, which has served as the foundation for recommendations reviewed by the California GreenMAP task force, in conjunction with BGA/Apollo staff, and summarized in the report, The California Green Manufacturing Action Plan, Policies to Grow Clean Energy Manufacturing Jobs In California. As in Michigan, the California GreenMAP task force is comprised of representatives from California business, investor, labor, policy, and environmental communities.